Remember those old silhouette iPod adds that were soooo cool? I can't wait to see how marketing sells these babies—3D video glasses with a HUD—from Apple. According to a patent app for a "Head-Mounted Display Apparatus For Retaining a Portable Electronic Device With Display" filed in August of 2008, Apple is at least exploring the possibility of video glasses—a wearable display that would stream A/V content from a pocketable device (like an iPod or iPhone) wirelessly, that would support "stereoscopic imaging" and that could be equipped with lenses coupled with "mirrors, diffusers, optics, lasers or any other suitable optical component" to create an actual HUD. Coupled with an integrated camera, the glasses can recognize head movement, allowing you to perform a bit of navigation hands-free. 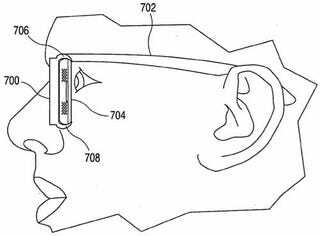 However, from our skim of the patent app, the glasses could be something as simple as a head mount for an iPod, too. It's a pretty dense, expansive document that leaves a ton of wiggle room. Yes, it's April 1st. But AppleInsider, who broke the story, assures us that the filing is legit (and we spotted the actual filing, which would be an epic prank indeed, at another source).